I tend to be leery of splits, sometimes failing to give enough attention to bands that would otherwise have me reaching for my wallet. It's easy to worry you're not getting the bands' best material or perhaps there's a contractual obligation being met using tracks that may be otherwise tossed off. 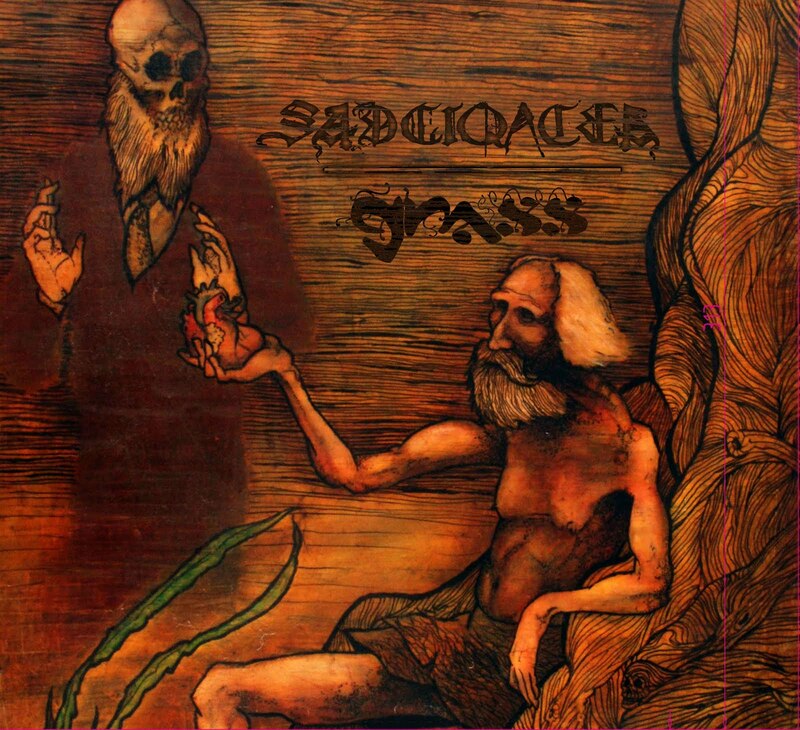 Today we feature two bands that slapped duct tape over my mouth and dragged me into an epic, haunting marsh of progressive sludge that shoves a boot straight up my expectations: Philadelphia's Sadgiqacea and Grass. The four-track Split begins with Sadgiqacea's distant, painfully melodic The Great Divide, a track that manages to remain thoroughly complex without stuffing its own shirt. Guitars buzz and chew on reverb as Fred's drums scamper just until a thrash pick-up buzzes through timber with listeners under one arm. Tempos shift abruptly, slowing to thick layers of hot crunch that ultimately tell us we won't soon dismiss this sticky sludge duo's beaten, bloody lumber through splintered hopes and fears. Remaining dense and ominous is no challenge on Avianizer, a beautifully creepy hum just beyond the pass. Evan's intermittent axe-grind spits and rhythms multiply, effective and well-placed. You won't know if this is a dream or a night terror, but waking on a damp battlefield is the best way to describe the unique, accomplished meld of crunchy bounce and misty despair. Evan and Fred do their part to echo and engage in cavernous vocal conflict. Sadgiqacea's coup de grâce, however, is smoldering buzz leading toward a web of intricate progressive sludge rolling out on Avianizer's impressive closing wave. We only get two tracks, fellas? 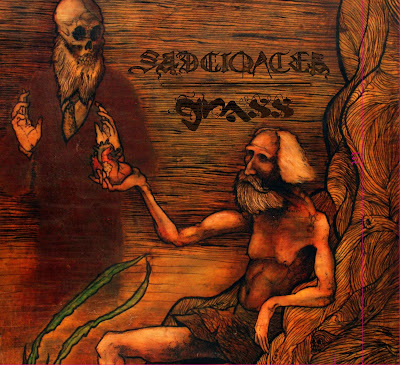 What makes this split work so well is that Sadgiqacea and Grass sound similar enough to notice no jump, yet different enough to differentiate themselves from one another (and from their influences). Future Ruins gradually adds one layer after another before fully embracing a devastating sludge drop. Combative and weathered, the progressions put Grass on a map closer to Savannah than Philadelphia. Grass relentlessly deliver successive blows until listeners can barely realize they're on a cloud. Moving from a full sludge assault to a spell in your grandfather's rocking chair, patience pays off. Minimalist by comparison, the heart of this 11-minute opus grows into cosmic swirls of psychedelia before creeping back to a thick bog, complete with a vocal tandem that enhances complexities. Whoa. Slapping your face and stomping your chest, abrupt and vicious guitars introduce Chasing Demons Out the Holler. Southern sludge metal has its place in Philadelphia, complete with swirling guitar blasts and pulverizing drumwork. Letting dirty boots cake a bit, the track hits neutral under speckled licks and a sea of cymbal taps. You knew this hammer was gonna drop, though, and severed sequoias return to breakneck tempos. The four tracks contained herein don't separate themselves from one another as they manage to expansively showcase the merits of two incredible Philadelphia progressive sludge giants. My hope is that the split is a sort of precursor to what audiences can (and will) expect from Sadgiqacea and Grass in 2012. But let's just focus on what we've got on our plate: this split delivers as well as any full sludge album you'll hear. From the skies to the swamps and within every haze in-between, these bands are both intent on re-writing the rules.